After any disaster, SSB allows you to restore servers directly from a disk-based backup. Unlike traditional backup services, there is no need to first partition your drive and install the operating system. Sector based backups increase speed and reduce overhead. Servers operate with minimal performance impact during backups by reading hard drives at a sector level and bypassing the file manager. Backups can usually be performed at anytime, even on busy servers. The SSB Agent keeps a journal of disk changes. Incremental backups know what sectors on the disk changed before the backup operation even starts. 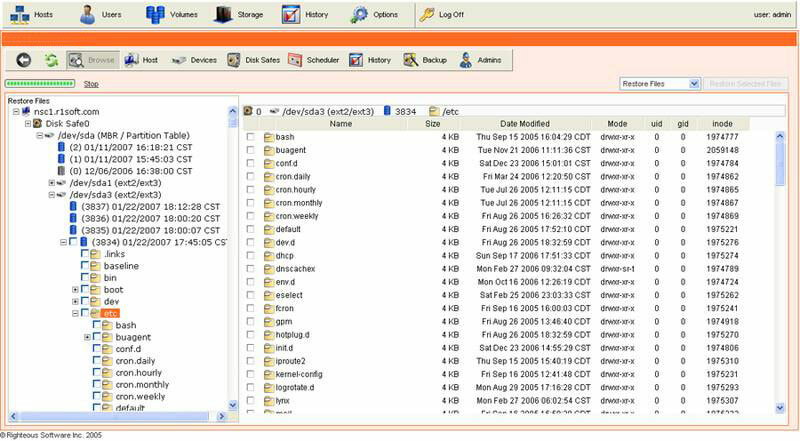 This eliminates need for file-by-file or block-by-block comparisons during every backup. 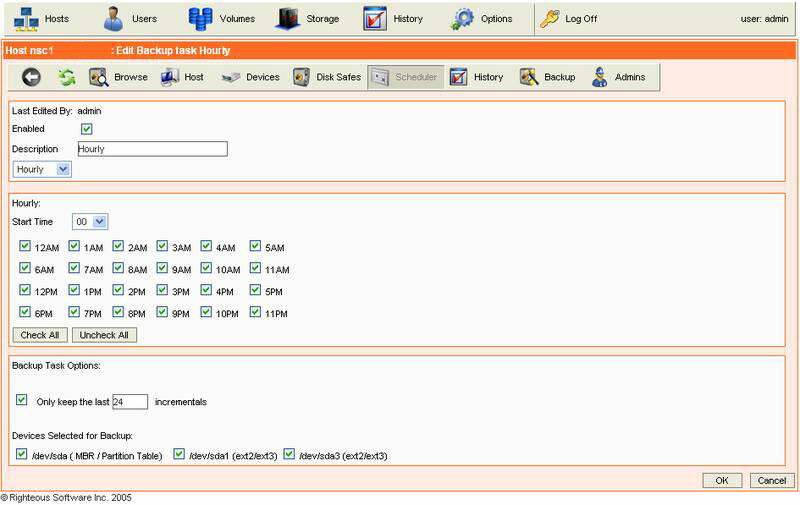 Incremental backups can be completed in minutes.Incremental sector based backups ignore unused portions of the disk and copy only the disk sectors that have changed since the last backup. This when used with traditional compression, reduces backup storage by as much as 90% when compared to a traditional system wide, file-by-file backup. Data is encrypted while in storage and during transmission using RSA keys. Decryption is only performed during a restore when the encryption key holder supplies their unique pass phrase. Software can be completely controlled offsite using a detailed web-based interface. 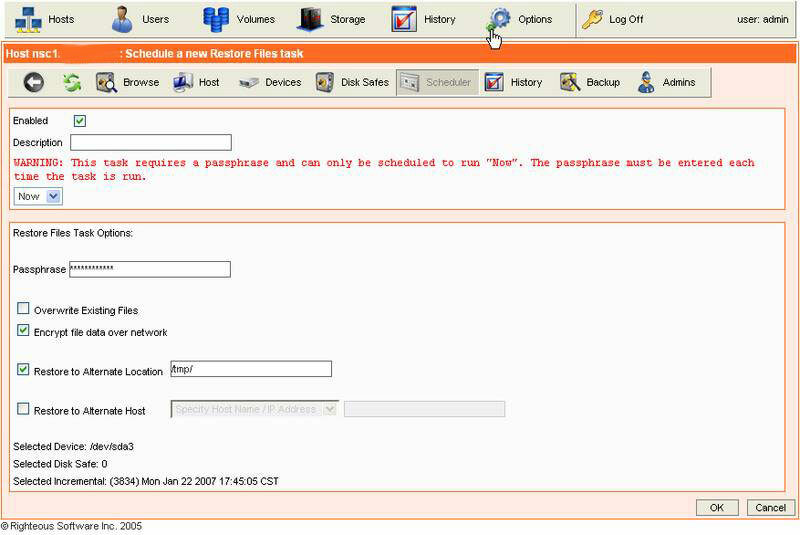 Using the remote administration any combination of tables, files, or databases can be restored to the original or alternate locations. SSB works by reading your hard disk volumes at the sector level, bypassing the file system for the ultimate in performance and recovery. This disk sector synchronization is performed while the server is online and provides no interruption to other I/O requests even on a busy server.By reading the disk at the lowest possible level point-in-time recovery images contain your files and all the formatting, partition tables, and volume configuration needed for complete and instant disaster recovery. Point-in-time volume snapshots are scheduled on the Vaultwise server. The Vaultwise server then periodically connects to the SSB Agent program and synchronizes changed disk sectors to the CDP Server. The Vaultwise Server creates a new point-in-time image of the disk volume every time it connects to the agent for synchronization. The point-in-time images are called recovery points and are securely stored on Vaultwise hardware. These recovery points can be accessed and restored using the web management console or any one of the boot recovery options. Recovery points only consist of a copy of changed disk sectors. This means it usually only take seconds or minutes to complete disk synchronization even on very large volumes. The more frequently recovery points are schedule the quicker they complete. When compression is enabled hundreds of recovery points can be stored in less space than it takes to store one disk image. In between synchronization requests from the Vaultwise Server, the SSB Agent passively tracks changes to the hard disks as they are happening. This process introduces NO overhead and requires a relatively small amount of memory. This is typically about 6MB ofmemory per 100GB of disk storage being synchronized. We charge a flat monthly fee based on storage requirements. There are not hidden costs for data restoration or bandwidth usage. To provide the most accurate quote we ask you fill out the short form linked below. You will receive a quote response within 24 hours.